Yang, H., Li, J., Xu, J., and Mo, L. (2017). "The critical analysis of catalytic steam explosion pretreatment of corn stalk, lignin degradation, recovery, and characteristic variations," BioRes. 12(1), 344-361. The lignin degradation and its structural change as a result of catalytic steam explosion pretreatment can be considered of great importance for both the subsequent fermentation and the further utilization of the lignin fraction. This work investigated the degradation mechanism and change in the characteristics of lignin during dilute sulphuric-acid catalytic steam explosion (SE) pretreatment and ammonia catalytic steam explosion (AE) pretreatment of corn stalk. For this purpose, two types of lignin samples obtained from the two pretreatments of aqueous products and solid residues were fractionated, and they were then characterized by a series of comprehensive analyses that consisted of gas chromatography-mass spectroscopy (GC-MS), ion chromatography (IC), Fourier transform infrared (FT-IR), Carbon-13 nuclear magnetic resonance (13C NMR), Carbon-Hydrogen two-dimensional heteronuclear single quantum coherence (13C-1H 2D HSQC), pyrolysis-GC-MS (Py-GC-MS), and field emission scanning electron microscopy (FE-SEM). Overall, the characteristic diversity of the lignin provides useful reference for high-value applications of lignin. The lignocellulosic biomass-to-bioethanol conversion is one of the most promising ways to supply sustainable energy and to prevent negative environmental impacts. Corn stalk, as an important agricultural residue, has enough reserves to provide a stable source of carbohydrates for bioethanol conversion. After pretreatment, corn stalk can be enzymatically hydrolyzed to fermentable sugars and then fermented to ethanol (Lynd 1989; Esteghlalian et al. 1997). However, prior to hydrolysis, pretreatment is necessary to break down the polymeric matrix in the carbohydrates and lignin, which consequently increases the enzyme accessibility to the recovered solid substrate during enzymatic hydrolysis (Kaparaju and Felby 2010). Of the pretreatment methods, steam explosion is the most effective method for hardwood and agricultural residues, due to their high content of acetyl groups in the hemicellulose (Wooley et al. 1999). During steam explosion, hemicelluloses are partially hydrolyzed to sugars by breaking glycosidic bonds with organic acids (Jacquet et al. 2011; Wang et al. 2016); under acidic conditions the sugars undergo a series of secondary reactions to produce furfural and 5-HMF. In addition, lignin degradation occurs by the cleavage of the α-ether and β-ether linkages under acidic conditions (Doherty et al. 2011). Therefore, there is easier solid substrate access for enzymes after pretreatment. Acidic chemicals such as H2SO4 (Lee and Jeffries 2011), H3PO4, SO2 (Neves et al. 2016), and CO2 (Alinia et al. 2010) can be used as catalysts to improve pretreatment efficiency. With the addition of acidic chemicals, hemicelluloses can be removed more completely, but more inhibitory by-products are also produced. These inhibitory chemicals, primarily organic acids, furans, aromatic aldehydes, and phenolic compounds, inhibit downstream enzymatic hydrolysis and fermentation (Cantarella et al. 2004; Monlau et al. 2004). Phenolic and aldehyde compounds, formed by thermal partial break-down of lignin, typically have a stronger inhibitory effect than by-products formed by carbohydrate degradation. Thus, an alkaline chemical preimpregnated steam explosion pretreatment has been proposed, owing in part to its high effectiveness at lignin solubilization and partly because lower enzyme loadings are required for enzymatic hydrolysis (McIntosh and Vancov 2011). Above all, the lignin degradation that occurs in pretreatment processes can be responsible for the inhibitory influence on downstream processes in bioethanol production. Furthermore, lignin, from either pretreatment effluent or hydrolysis residue, is required for further utilization for high value-added products. Therefore, it is necessary to investigate the characteristic changes in lignin after pretreatment to understand how to obtain good quality lignin. In the present work, corn stalk was chosen as the raw material, while dilute sulphuric-acid and liquid ammonia were used as catalysts for steam explosion pretreatment. Lignin degradation during the two pretreatments was evaluated by the detection of degradation products in the aqueous products. Moreover, lignin samples, were isolated from the pretreatment liquid/solid residues by various methods, including acidic precipitation, dialysis, solvent extraction with acetone/water solutions, and ball milling. The lignin samples were characterized using ion chromatography (IC), Fourier transform infrared spectroscopy (FT-IR), carbon-13 nuclear magnetic resonance (13C NMR), carbon-hydrogen two-dimensional heteronuclear single quantum coherence (13C-1H 2D HSQC), pyrolysis-gas chromatography-mass spectroscopy (Py-GC-MS), and field emission scanning electron microscopy (FE-SEM). Raw corn stalk obtained from northeast China was used as the feedstock. The corn stalk was cut into about five-centimeter length to reduce energy consumption. The solid composition of corn stalk, as determined by standard NREL methods (Sluiter et al. 2008), was 28.0 wt.% glucan, 19.3 wt.% xylan, 2.7 wt.% arabinan, 0.88 wt.% galactan, 0.72 wt.% mannan, 26.6 wt.% lignin, 4.1 wt.% benzene-alcohol extractive, and 4.3 wt.% ash. Commercial cellulase (Celluclast 1.5) was obtained from Novozymes Biotechnology Co., Ltd. (Tianjin, China), and it had a filter paper activity of 127 FPU/mL. β-glucosidase (Novozyme 188) was also obtained from Novozymes and had an enzyme activity of 285 CBU/mL. DMSO-d6 (99.9%) was purchased from Sigma-Aldrich (St. Louis, USA). Other chemical reagents used in this paper were all of analytical reagent grade. where t is the pretreatment time (min) and T is the pretreatment temperature (°C). The extraction step of the obtained aqueous samples prior to analysis was conducted with dichloromethane at a ratio of 10:1. After this was repeated three times, the organic phase was separated and then condensed to approximately 1 mL at a reduced pressure with a rotary evaporator. Subsequently, the extracted samples of organic fractions were detected by a GC-MS (7890A GC system/5975C MS Detector, Agilent Technologies, Inc., Santa Clara, USA). The GC-MS was equipped with a DB-5 MS column (30 m × 250 μm × 0.25 μm). The injection and detector temperatures were set at 250 °C and 280 °C, respectively. The oven temperature program began at 40 °C for 5 min, increased to 130 °C for 4 min, and increased again to 280 °C for 15 min, at a heating rate of 25 °C/min. Helium was used as the carrier gas at a constant flow rate of 1 mL/min. The scan range of the mass spectrum was 33 to 500 m/z, and the mass spectra were identified with NIST 14. L (http://www.sisweb.com/software/ms/nist.htm#ei). Two types of lignin samples, obtained from pretreatment aqueous and solid residue, were isolated and further purified as described in Fig. 1. In here, the letter “S” indicates sulphuric acid and the letter “A” indicates ammonia. In particular, SE lignin (SEL), obtained from the SE pretreatment of aqueous product, was precipitated by adjusting to pH 2 with 6 mol/L of NaOH. The precipitate was separated by centrifugation, and then washed until the wash water was neutral. AE lignin (AEL) was obtained from the AE pretreatment of aqueous product, and acidic precipitation was conducted with 3 mol/L of H2SO4 at pH 5. 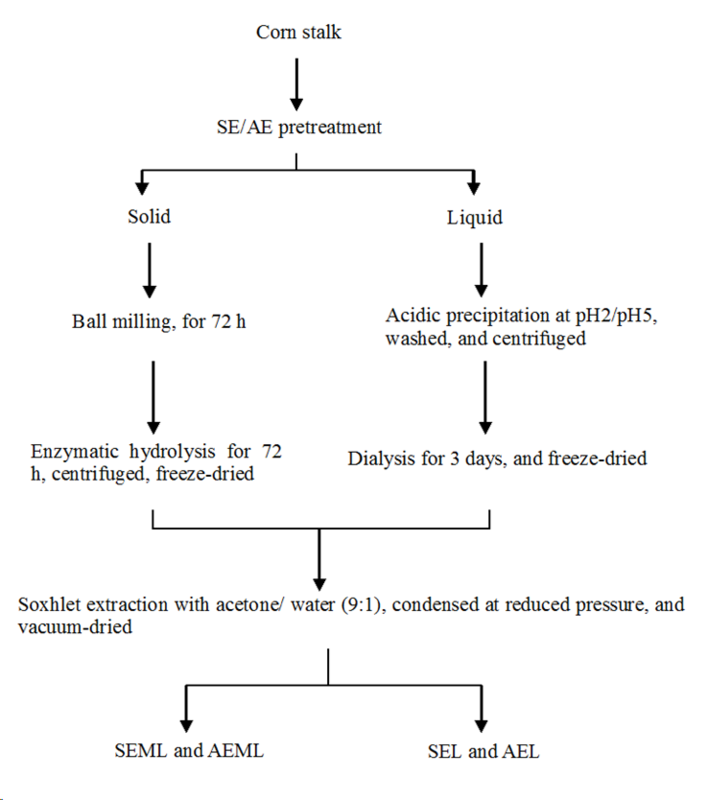 Subsequently, dialysis was performed in a dialysis membrane with a molecular weight cutoff of 7000 Da for 3 days. SE-residue milled lignin (SEML) and AE-residue milled lignin (AEML) were prepared by ball milling, enzymatic hydrolysis, and solvent extraction. The grinding step was performed in a planetary ball mill (PQ-N2, Across International, Livingston, USA) for 72 h. For enzymatic hydrolysis, the grinded pretreatment residues were mixed with certain enzyme loadings of Celluclast 1.5L and Novozyme 188 at 2% (w/v) in 50 mmol/L sodium citrate buffer (pH 4.8) at 50 °C and 300 rpm for 72 h in a Thermomixer shaker. The loading dosage of cellulase and β-glucosidase were 60 FPU/g and 120 CBU/g to substrates, respectively. Solvent extraction was repeated three times in a Soxhlet extractor with acetone/water (9:1) at a solid-to-liquid ratio of 1:30 for 4 h. The extracted lignin was isolated, condensed at reduced pressure, and vacuum-dried at 40 °C for 24 h.
Similar to the residue lignin samples, milled wood lignin obtained from raw corn stalk (RML), which acted as a control, was prepared by ball milling, enzymatic hydrolysis, and solvent extraction. The solid composition of the isolated lignin samples was analyzed following the standard NREL method (Sluiter et al. 2008). The sugar concentrations were analyzed by an ion chromatography system (Dionex ICS-5000, Thermo Fisher Scientific, Waltham, USA) with a supporting electrochemical detection. The sugars were separated by a Dionex CarboPac PA20 column (Thermo Fisher Scientific) at a flow rate of 0.5 mL/min at 30 °C. The eluents were 200 mmol/L NaOH and 1 mol/L sodium acetate. FT-IR was performed on a Bruker VERTEX 70 spectrometer (Billerica, USA). The spectra were recorded in the 1800 to 600 cm-1 range with a resolution of 4 cm-1. 13C and HSQC NMR spectra were both collected on a Bruker AVANCE III HD 600 MHz spectrometer (Ettlingen, Germany) operated at 25 °C. For 13C spectroscopy, 120 mg of the isolated lignin was dissolved in 0.6 mL of DMSO-d6 (99.9%).The spectra were recorded in an FT mode at 100.6 Hz. 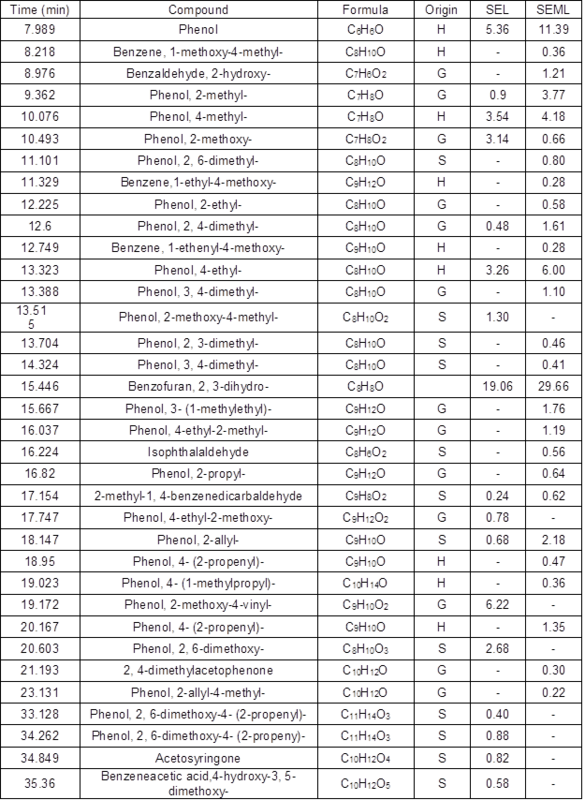 Other parameters applied in the 13C NMR experiments were a 90° pulse angle, 2 s relaxation delay, and 60000 scans. HSQC NMR spectra analysis was performed with 30 mg of lignin samples in 0.6 mL of DMSO-d6 with a 90° pulse angle, 0.11 s acquisition time, 1.5 s relaxation delay, 256 scans, and a 1JC-H of 145. The Py-GC-MS analysis was performed using an Rx-3050TR Tandem μ-Reactor (FRONTIER LAB, Fukushima, Japan), which was connected to a GC-MS (7890B GC system/5977A MS Detector, Agilent Technologies). Approximately 0.6 mg of the lignin samples were pyrolyzed at 600 °C for 30 s. The GC-MS was equipped with a ZB-5HT column (30 m × 250 μm × 0.25 μm). The GC oven temperature program started at 50 °C for 2 min and increased to 90 °C for 1 min, at a heating rate of 10 °C/min, followed by an increase to 150 °C for 5 min at a 3 °C/min heating rate, and finally increased to 350 °C for 3 min at a heating rate of 20 °C/min. Helium was used as the carrier gas at a constant flow rate of 1 mL/min. The temperatures of the MSD transfer line and the GC injector were 300 °C and 350 °C, respectively. The scan range of the mass spectrum was 10 to 500 m/z, and the mass spectra were identified with NIST 14. L.
FE-SEM measurements were performed on a MERLIN FE-SEM (Carl Zeiss Microscopy, Oberkochen, Germany) after the samples were AU-coated by sputtering method using a JEOL JFC-1600 coater sputter (Redding, USA). 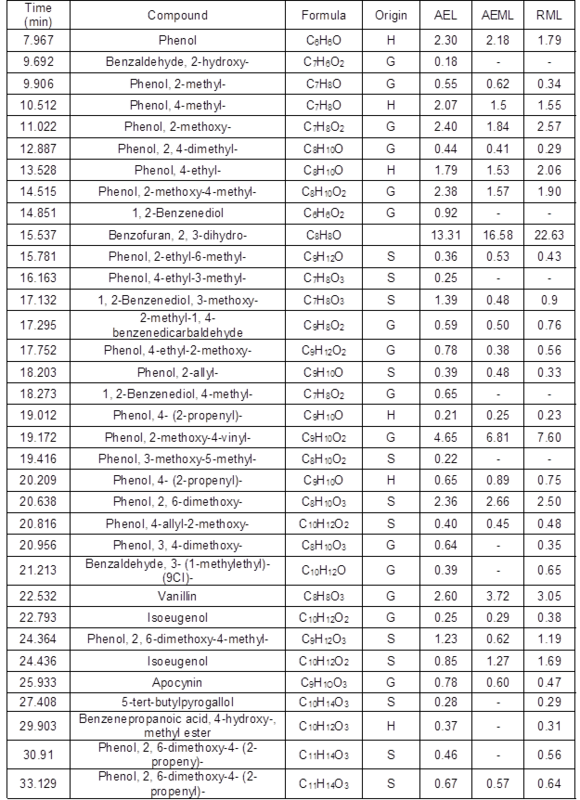 To elucidate the major constituents of degraded lignin from corn stalk in the SE/AE pretreatments, major organic fractions in the pretreatment aqueous products were detected by GC-MS. Table 1 details the major organic compounds in the SE pretreatment aqueous products at CSF 3.5. The aqueous products contained furans, phenols, aromatic aldehydes, organic acids, acetones, and esters. Furans were a large constituent of the aqueous products, and mainly consisted of furfural (C5H4O2), 5-methyl furfural (C6H6O2), and 5-HMF (C6H6O3), which were formed by pentose and hexose acidic degradation. As expected, phenols and aromatic aldehyde compounds were enriched in the aqueous products of SE pretreatment indicated lignin depolymerization. There were also organic aromatic acids including vanillic acid (C8H8O4), syringic acid (C9H10O5), ferulic acid (C10H10O4), and sinapic acid (C11H12O5). This was probably due to the further oxidation of the side chains of lignin under acidic conditions. In addition, esters in the form of methyl vanillate (C9H10O4), diphenylacetic acid, and methyl ester (C15H14O2) were probably formed by the esterification reaction between aromatic acids and alcohols. The major lignin degradation products obtained at different CSFs were detailed in this study. Phenols and aldehydes, as the main lignin degradation products, are summarized in Fig. 2. Phenols, which mainly consisted of phenol, 2-methoxy-4-vinyl- (G), and phenol, 2-methoxy-4-propyl- (H), were formed rapidly as the CSF increased from 2.65 to 3.47. G and H represent guaiacyl and p-hydroxyphenyl units of lignin, respectively. Aldehyde compounds mainly included benzaldehyde, 4-hydroxy- (H), vanillin (G), syringaldehyde (S), coniferyl aldehyde (G), and sinapinaldehyde (S). S represents syringyl units of lignin. 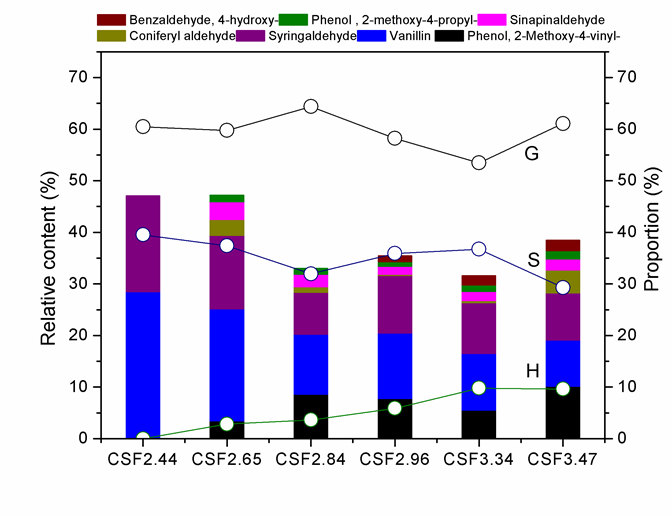 Vanillin and syringaldehyde were both found in large quantities in the pretreatment products, and the relative contents slightly decreased at higher CSFs, which was probably due to the increased formation of phenols and other aldehydes. Furthermore, lignin degradation products contained more amounts of G-type products than S-type, and the S/G ratio of lignin degradation products was approximately 0.59. This data revealed a preferential removal of G-type lignin over S-type lignin during the SE pretreatment. Table 2 details the major organic products generated during the AE pretreatment of corn stalk. The aqueous products included benzofuran, 2,3-dihydro- (C8H8O), 2-methylpyrazine (C5H6N2), vanillin, and some phenolic compounds. Benzofuran, 2,3-dihydro- was largely retained in the pretreatment aqueous products, and the content was about 49.13%, which was formed by the breakage of the phenyl coumaric structure of lignin. In addition, phenol, 2-methoxy- (g), phenol, 2-methoxy-4-vinyl- (g), phenol, 2,6-dimethoxy- (s), conipheryl alcohol (g), apocynin (g), and acetosyringone (S) were found in the pretreatment aqueous products, and the relative contents ranged from 1.72% to 14.96%. Therefore, the S/G ratio of lignin degradation products estimated was about 0.15, which suggested that in the AE pretreatment more amounts of G-type lignin were degraded, like in the SE pretreatment. Overall, relatively smaller amounts of phenolic compounds were released during the AE pretreatment than in the SE pretreatment. The solid compositions of the five lignin samples were analyzed. 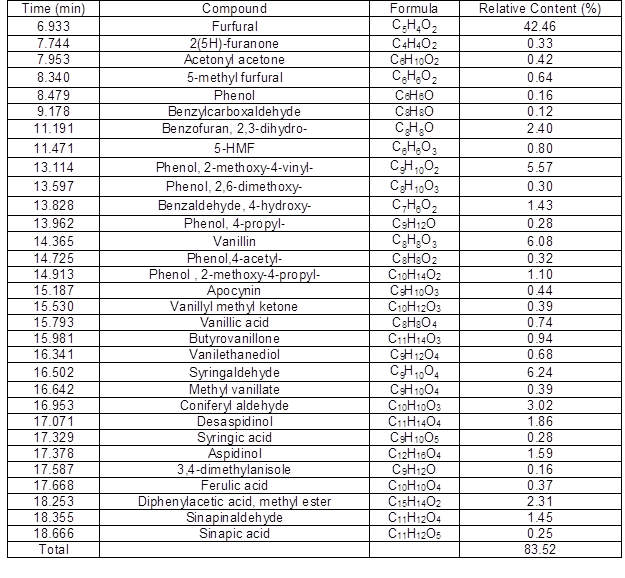 As shown in Table 3, the ash contents in AEL and SEL were lower than in the three residue lignin samples, which suggested that inorganic compounds were effectively removed by dialysis. This result was consistent with the results reported by Fang et al. (2015), who found that dialysis was an efficient way to remove inorganic compounds to obtain more pure kraft lignin. Moreover, the sugar contents in two of the residue lignin samples, AEML and SEML, were both appreciably lower compared with RML. This was mainly due to the fact that both of the pretreatments broke down the polymeric matrix that consisted of carbohydrates and lignin, which consequently led to the effective removal of carbohydrates by enzymatic hydrolysis after ball milling. 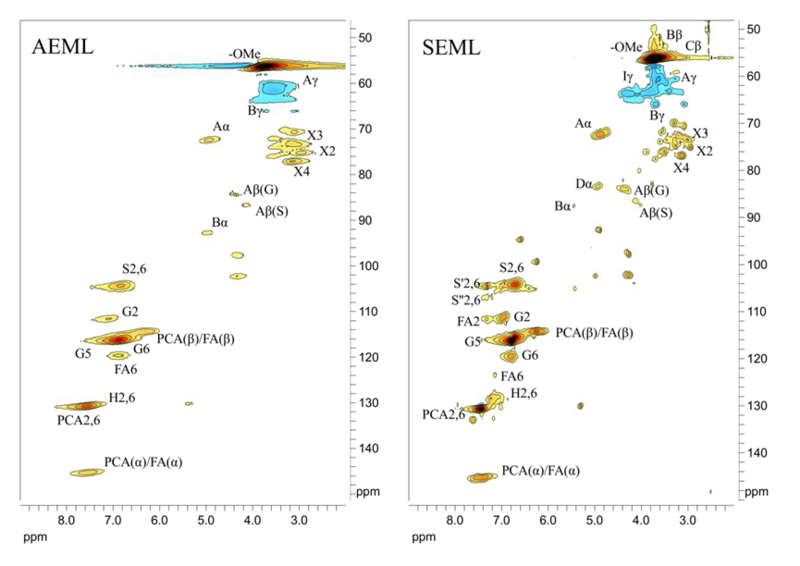 The FTIR spectra of the isolated lignin samples are represented in Fig. 3. The triplet absorption peaks were observed in all of the spectra at 1424, 1513, and 1605 cm-1 due to the lignin of aromatic ring vibrations. The peaks at 1327 and 1124 cm-1 corresponded to the stretching vibrations (C-O) and aromatic in-plane vibrations (C-H) of syringyl units, respectively. 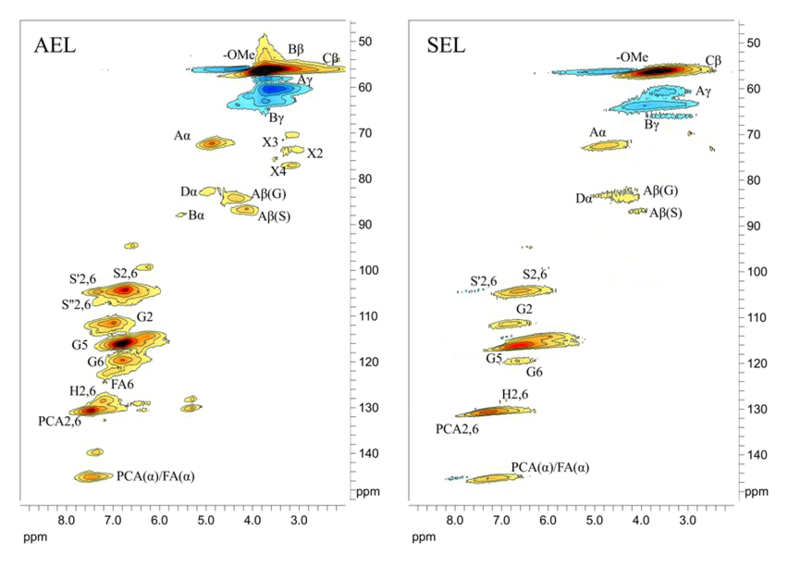 AEL and AEML showed peaks with stronger intensities at 1327 and 1124 cm-1, compared to SEL and SEML, which displayed degradation selectivity in syringyl units of lignin during both pretreatments. Moreover, a similar result was obtained in aromatic out-of-plane C-H vibrations of syringyl units at 833 cm-1. The strong absorption peaks at 1034 and 1168 cm-1 originated from the characteristic peaks of G and H units, respectively. Furthermore, after the SE pretreatment (SEML), there was an increase in the intensity of the peaks at 899 cm-1, which represented acid-catalyzed lignin condensation (Li et al. 2009; Serrano et al. 2010). Similarly, the disappearance of the ester linkages at 1715 cm-1 indicated the degradation of the β-O-4’ linkages of lignin during the AE pretreatment (Xiao et al. 2014). In the HSQC analysis, signals assigned to the aromatic rings and side chains of lignin were mainly in the region of δC/δH 90-155/6.0-8.0 and δC/δH 50-90/2.5-6.0 ppm, respectively (Wu et al. 2013). As shown in Figs. 4 and 5, G and S units were observed as the most remarkable signals in all lignin samples, which confirmed the results obtained by FT-IR analysis. In the aromatic region of the NMR spectra, signals assigned to the G units of lignin were at δC/δH 111/6.95 (G2), δC/δH 115.1/6.78 (G5), and δC/δH 118.3/6.80 ppm. The signals from S units were found at δC/δH 104.1/6.72 ppm. Additionally, the signals from S’ and S’’ units in the pretreated lignin at δC/δH 105.9/7.18 and δC/δH 106.8/7.21 ppm, respectively, indicated structural changes in syringyl units of lignin in both pretreatments. Consequently, after both pretreatments, there were relatively large increases in the S/G ratios, which indicated a preferential removal of G-type lignin. Furthermore, the signal located at δC/δH 111.2/7.28 ppm, which corresponded to ferulate (FA), was remarkably decreased. This suggested the destruction of lignin-carbohydrate complex (LCC) during both pretreatments (Vanderghem et al. 2011; Yang et al. 2016). In the side chain region of the HSQC spectra, the predominant signal at δC/δH 55.6/3.72 ppm was assigned to methoxyl (-OCH3). The signals of the β-O-4 linkages of lignin, Aγ, Aα (G), Aα (S), Aβ (G), and Aβ (S), were identified at δC/δH 70.7/4.75, δC/δH 83.8/4.30, δC/δH 72.0/4.83, δC/δH 84.3/4.31, and δC/δH 86.0/4.08 ppm, respectively. The content of the observed β-O-4’ linkages sharply decreased, which directly confirmed that both pretreatments mainly led to the breakage of the β-O-4’ structure of lignin. Based on the data summarized in Table 4, phenylcoumaran (β-5’), resinols (β-β’), and dibenzodioxocin (5-5’) all showed remarkable decreases after the AE pretreatment compared to the control RML. In particular, the relative content of phenylcoumaran was reduced by approximately 57.6%, which suggested that phenylcoumaran structures of lignin were largely degraded under alkaline catalytic thermal conditions. Only a slight change of the β-5’ content was observed for the SE pretreatment, which demonstrated that under acidic conditions the phenylcoumaran structure was relative stable. In fact, less side-chain cleavage was seen in the SE pretreatment than in the AE pretreatment (Doherty et al. 2011). Based on previous reports (Robert et al. 1986, 1988), the depolymerization by acidolysis of the β-O-4’ linkages and the acid-catalyzed repolymerization occurred simultaneously during the SE pretreatment. The repolymerization occurred between the aromatic C6 or C5 and carbonium ions, which were formed by the cleavage of the α-hydroxyl and α-ether groups in the first reaction of acidic pretreatment. The intermediary carbonium ions reacted with the weakly nucleophilic positions of other phenylpropane units to form new stable C-C bonds, and the condensation for G-type lignin was more vulnerable compared to S-type lignin. As a result, the comprehensive repolymerization led to increased molecular mass of the lignin and decreased solubilization of lignin (Li et al. 2007). The pyrolytic performance of all the isolated lignin samples were evaluated by Py-GC-MS, and the main lignin-derived pyrolysis products are summarized in Tables 5 and 6. The lignin-derived pyrolysis products of all the lignin samples mainly contained phenols, aldehydes, and esters, which were formed by the pyrolysis of G, S, and H units of lignin. Remarkably, greater amounts of G lignin pyrolysis products were obtained than S and H lignin for all of the lignin samples. Moreover, the product distribution of the AE pretreated lignin samples, AEL and AEML, was similar to that of the control RML, but not similar to SEL and SEML. For the latter particularly, aldehyde compounds, such as vanillin and syringaldehyde, were observed rarely in the pyrolysis products. A possible explanation was that the oxidized products were more vulnerable to decomposition, and yielded the corresponding alkoxy phenol and methyl-phenol. Benzofuran, 2,3-dihydro- (C8H8O), related to the phenylcoumaran structures (PCA) of lignin, were found in large amounts in the pyrolysis products of the pretreated lignin samples, AEML and SEML, and the control RML. Compared to the control RML, the pyrolysis products of the SE degraded lignin (SEML) contained larger amounts of phenol. A related experiment was performed by Custodis et al. (2015), who investigated fast pyrolysis of soft and hardwood lignin prepared by various methods. Klason lignin produced a higher quantity of phenols at temperatures exceeding 550 °C than organosolv and kraft lignin. The authors of this study hypothesized that in Klason lignin, the new C-C bonds formed by acid-catalyzed condensation between the aromatic C6 or C5 and carbonium ions formed stable radicals at higher temperatures, leading to relatively fewer rearrangement reactions of phenols (Dorrestijn et al. 2000; Custodis et al. 2015). Figure 6 shows the surface morphology of lignin samples after extraction by acetone/water (9:1). Before and after the AE pretreatment, the lignins exhibited spherical and round shaped particles. The collapse surface morphology was observed for SEL and SEML, which was probably due to the substantial depolymerization and decreased solubilization of lignin in acetone/water. Recent interest in lignin is focused on the production of aromatic chemicals (Lee et al. 2016), platform intermediates (Wang et al. 2013), polymer filler (Mousavioun et al. 2010), and water-reducing admixture. In addition, lignin is also expected to be used in micro- and nano-structured lignin-based materials (Duval and Lawoko 2014), such as aerogels (Perez-Cantu et al. 2014), nanoparticles (Frangville et al. 2012; Yang et al. 2016), and microcapsules (Norgren and Edlund 2014). Alkaline lignin is the preferred substrate for functionalized lignin-based materials due to its good solubility and formability in organic mediums. However, acidic lignin has a potential use as a supplementary source of aromatic structures for the production of aromatic chemicals. GC-MS analysis revealed that the G and S units of lignin were partly degraded into the phenols and aldehyde compounds, respectively, during the sulphuric acid catalytic steam explosion (SE) pretreatment, but rarely in the ammonia catalytic steam explosion (AE) pretreatment. G-type lignins were preferentially removed in both pretreatments. The predominant reactions in lignin during the AE pretreatment were the cleavage of the β-O-4’ linkages and side chain linkages, while the latter rarely occurred in the SE pretreatment. The degradation reactions of lignin during the SE pretreatment were mainly the depolymerization by acidolysis of the β-O-4’ linkages and the concurrent acid-catalyzed lignin condensate. After the SE pretreatment, lignin decomposed to yield higher quantities of phenols, which was probably due to acid-catalyzed condensation of lignin alleviating radicals’ rearrangement reactions so as to produce more phenols. The SE pretreated lignins exhibited collapse surface morphology, which indicated there was substantial depolymerization and decreased solubilization of lignin during the SE pretreatment. The National Water Pollution Control and Treatment Science and Technology Major Project (No. 2014ZX07213001), the Special Support Plan for High-Level Talent Cultivation of Guangdong Province (No. 2014TQ01N603), and the Key Laboratory of Pulp and Paper Science & Technology of Ministry of Education of China (KF201508) are gratefully acknowledged for financial support. Robert, D., Bardet, M., Lapierre, C., and Gellerstedt, G. (1988). “Structural changes in aspen lignin during steam explosion treatment,” Cell. Chem. Technol. 22(2), 221-230. Article submitted: September 1, 2016; Peer review completed: November 4, 2016; Revised version received and accepted: November 9, 2016; Published: November 16, 2016.